The first bell of the new school year hasn't even rung, and Texas high school teacher Jocelyn Shore is already at the scene of a murder. Friend and fellow teacher Fred Argus has been found dead on campus, and it isn't long before the annoying, albeit attractive, Austin police detective Colin Gallagher uncovers evidence that Fred might have been selling drugs to students. Shocked by her loss as well as the insinuation that Fred was a dealer who got what he deserved, Jocelyn starts asking the kinds of questions guaranteed to set fellow teachers, administrators, and parents on edge. With the school serving as the setting for a big-time director's latest film, her investigation could hardly have come at a worse time. Jocelyn, however, finds clearing her friend's name far more important than the needs of a pesky movie crew and doesn't care who knows it. But it's only when she's attacked while on set that she realizes someone is determined to make sure the secrets hidden by Fred's death remain hidden no matter what the cost. 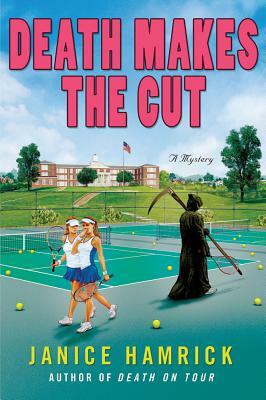 Humor, romance, and murder abound in Janice Hamrick's follow-up to her Minotaur Books/Mystery Writers of America First Crime Novel Award--winning debut, "Death on Tour," and make "Death Makes the Cut" a charming addition to this outstanding new series. Janice Hamrick is the author of two titles in her Jocelyn Shore mystery series. The first, "Death on Tour," was the winner of the Minotaur Books/Mystery Writers of America First Crime Novel Competition, a finalist for the Mary Higgins Clark Award, and a nominee for the Romantic Times Reviewers' Choice Awards Best First Mystery. She lives in Austin, Texas.